2. 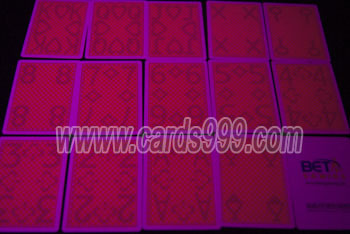 Jumbo index, 100% plastic, washable playing cards. How to mark the BETA playing cards? How to read BETA marked deck of cards? We can wear infrared contacts on my eyes, and we can see the poker cards back have luminous ink and invisible mark, have white or black marks, this is the lumminous marked cards.